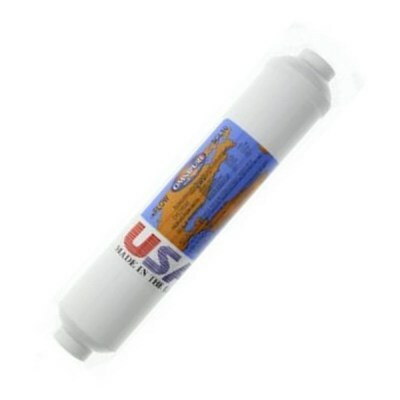 The Omnipure SL10 is a 2" x 10" Granular Activated Carbon and Polyphosphate Inline Filter. It is highly effective at reducing chlorine and other chemical disinfectants and pesticides and inhibiting scale. This filter has 1/4" female thread connectors and is available with straight, fixed elbow or swivel elbow push fittings for 1/4" tubing. The Omnipure SCL10 Chlorine Filter With Scale Inhibitor can be used in undersink water filter systems, fridges, ice machines, water coolers, drinking fountains and reverse osmosis systems. The Omnipure SCL10 Chlorine Filter With Scale Inhibitor produces much better tasting water and controls lime and scale deposits. The Omnipure SCL10 Chlorine Filter With Scale Inhibitor uses GAC (Granular Activated Carbon) and Polyphosphate. ANSI/NSF International Standards: Tested and Certified by NSF International against ANSI/NSF Standard 42 for Taste and Odour Reduction and Chlorine Reduction Class I. The scale inhibiting properties of polyphosphates are affected by the chemistry of the water being treated and will vary. • Note flow direction of filter. • For quick connect fittings, push scratch free tube end into the fitting until it bottoms. Threaded fittings must be wrapped with Teflon™ tape before installation. Install Teflon™ taped fittings and tighten firm. Use two wrenches to firmly tighten tubing. • Flush new cartridge with 5 gallons of water prior to use and check for leaks. If leaks occur, check tightness of tubing and fittings. • Replace cartridge when rated capacity (1,500 gallons/1 year) is reached, or when flow becomes too slow. • The contaminants or other substances removed or reduced by this water treatment system are not necessarily in your water. • “Do not use with water that is micro-biologically unsafe or of unknown quality without adequate disinfection before or after the system.